In what will likely be the largest gathering in the U.S. to hear an anti-Semite this year, approximately 20,000 people are expected to convene this weekend in Rosemont and Chicago, Illinois, for the Nation of Islam’s (NOI) annual Saviours’ Day convention. Over the past three years, the NOI has engaged in a wide-ranging campaign to demonize Jews. Not only have the speeches delivered by Louis Farrakhan been among the most hateful of his 30-year career as head of the NOI, but the organization's media arm has also reinforced these messages through a range of propaganda. Under Farrakhan’s leadership, Saviours’ Day has served as the NOI’s premier event promoting anti-Semitic conspiracy theories, including accusations of Jewish control over government, media, finance and entertainment. In addition to Farrakhan’s keynote address, which often serves as the weekend’s primary platform for these views, this year’s event will feature a plenary session seeking to demonstrate disproportionate Jewish involvement in the slave trade. 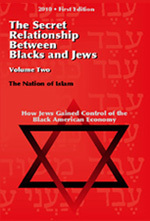 The plenary session, titled “Business is Warfare: The Secret Relationship Between Blacks and Jews,” takes its name from a set of NOI books alleging that Jewish exploitation of Blacks during the slave trade has caused deep and prolonged repercussions for African-Americans. A similar plenary session devoted to this topic during the 2011 convention called for the inclusion of the books in educational curricula nationwide. Another plenary session, titled “9/11: What Really Happened and Why?” is being billed by the NOI as an examination of “all angles of the events which took place on that day” and will feature a known “9/11 truther” group.